The first in a regular series of DARC profiles – a chance to find out more about people in key roles and members of the different squads. My mother had been an athlete in Berlin at the start of the war. She injured her ankle and was advised to take up rowing to strengthen it. At the age of 15, I was looking for a sport, Fencing was a disaster for me – even the girls beat me. So my mother suggested rowing. 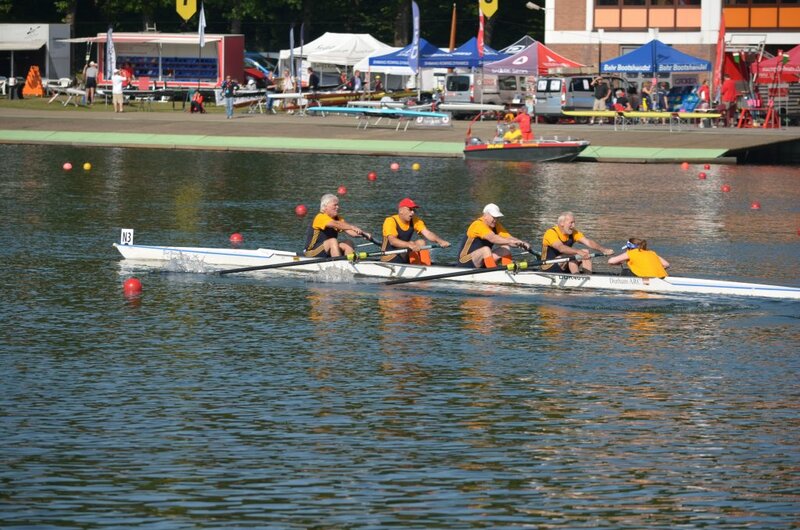 A slightly older Martin, rowing at 2 in the DARC F4, losing out by just .6 of a second at the World Masters at Duisberg in 2012. 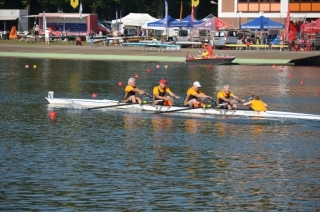 And below rowing at 6, winning Henley Masters F eights in 2011. I don’t like to talk about it .. But it would be either ..
During my A levels sculling at York Spring. Coming into Scarborough bridge, I was 5 lengths up .. I clipped the buoy and rolled over. Or, in the pair, with Dave at Nottingham, in the Semis. The first 2 were to go through to the final. We were ahead at 1800 metres. I was steering, I hit the buoy, the chain wrapped around my oar, the boat spun through 90 degrees, we stopped, and were unable to untangle from it, now we were in 5th. I still wake up sweating, thinking about it. I’ve never steered the pair since. How do you see your role as Chairman? This entry was posted in Club News, News on December 5, 2013 by Andy Jaggard.